A regular breeding species and migrant; the Orchard Oriole was an uncommon species during the Minnesota Breeding Bird Atlas (MNBBA). A species of the eastern United States, the Orchard Oriole is found largely from the Great Plains east to the Atlantic Coast and south into Central America. Small populations are also present across the very southern edge of Canada, from southern Saskatchewan east to southeastern Ontario. The species reaches its highest breeding densities in the Northern and Central Plains states and in the southeastern United States (Figure 1). A long-distance migrant, spending the winter in Central America and northern South America. Primarily a foliage gleaner feeding on a variety of terrestrial insects; also consumes some fruit and nectar. A woven hanging basket placed within a dense tree or shrub; sometimes nests in small colonies further west and south in its breeding range. Breeding distribution and relative abundance of the Orchard Oriole in North America based on the federal Breeding Bird Survey from 2011 to 2015 (Sauer et al. 2017). The Orchard Oriole reaches the northern periphery of its breeding range in Minnesota. Roberts (1932) described the species as “a comparatively uncommon summer resident throughout the southern part of the state.” Considered most common in riparian groves of western Minnesota, it was also present along the Mississippi River north into Stearns and Morrison Counties and north through the Red River valley. Relatively common in west-central Minnesota, it became increasing rare going north toward the Canadian border. Confirmed nesting records (nests with eggs or adults incubating) were available from Jackson and Pipestone Counties in the southwest, Traverse County in west-central Minnesota, and Hennepin County in east-central Minnesota. Inferred nesting reports (nests, nest building, and fledged young) were available from Anoka, Goodhue, and Grant Counties. Forty years later, when Green and Janssen (1975) provided an updated account of the species status, it had largely retreated from the northern edges of its breeding range in the state. There were no documented records north of Clay County since Roberts’ publication, and the authors noted that it had become quite rare in the central region of the state: “the species is scarce north of the Twin Cities in the east and north of the headwaters of the Minnesota River in the west.” Reports in south-central Minnesota also were scarce. Clearly, Minnesota was witnessing the same range contractions and decreases in abundance that were being documented further east along the northern periphery of its breeding range. Orchard Orioles, for example, began declining in southeastern New York in the 1920s and in western Pennsylvania during the first half of the twentieth century (Scharf and Kren 2010). The decline was attributed to the loss of orchards and other agricultural lands in the face of increasing development. When Janssen (1987) provided an updated account several years later, the species appeared to be moving northward again in the Red River valley, with reports now common as far north as Red Lake County. Overall, however, the species was most frequently observed in southeastern and southwestern Minnesota and along the Minnesota River Valley. Since 1970 nesting had been confirmed in 16 counties (Janssen 1987) and in 21 counties by 1998 (Hertzel and Janssen 1998), the majority of which were confined to the southern half of the state. As of 2014, the Minnesota Biological Survey (MBS) has documented a total of 320 breeding season locations for the Orchard Oriole. Whereas Janssen (1987) had reported the species as common in the southeastern corner of the state in Houston, Winona, and Wabasha Counties, the Biological Survey documented only one occurrence in the region, in southeastern Houston County along the Iowa border. The species’ entire range appeared to have shifted westward and, although uncommon, had reestablished itself in the Red River Valley north to the Canadian border (Minnesota Department of Natural Resources 2016). The MNBBA reported 874 Orchard Oriole records in 13.2% (628/4,749) of the surveyed atlas blocks and in 16.2% (378/2,337) of the priority blocks. Breeding was documented in 60 surveyed blocks (Figures 2 and 3; Table 1). The species was reported in 69 of Minnesota’s 87 counties and was confirmed nesting in 40 counties, including as far north as Roseau County in northwestern Minnesota. Four of the counties were included as confirmed nesting counties because of blocks that straddled two counties: Anoka, Isanti, Rice, and Scott. Twenty-eight of the counties were additions to the list published by Hertzel and Janssen (1998). The MNBBA data reflect what states further to the east have documented. The Orchard Oriole has in recent years increased in abundance and largely reoccupied much of its former breeding range following population declines and range contractions. In Ohio, for example, the oriole was considered common throughout the state at the end of the nineteenth century. Thirty years later, it had declined to the point that it was described as rare to uncommon, particularly in the eastern half of the state, only to rebound again beginning in the 1940s (Rodewald 2016). A similar story has unfolded in Wisconsin, where the species was very common and expanding its range in the early 1900s, only to recede in range and decline in numbers throughout most of the first half of the twentieth century. By the late 1960s it was once again on the move northward (Cutright et al. 2006). Breeding distribution of the Orchard Oriole in Minnesota based on the Breeding Bird Atlas (2009 – 2013). Summary statistics of observations by breeding status category for the Orchard Oriole in Minnesota based on all blocks (each 5 km x 5 km) surveyed during the Breeding Bird Atlas (2009-2013). Summary statistics for the Orchard Oriole observations by breeding status category for all blocks and priority blocks (each 5 km x 5 km) surveyed during the Minnesota Breeding Bird Atlas (2009-2013). The Orchard Oriole utilizes a range of diverse habitats, including farm shelterbelts, riparian woodlands, planted roadsides, and the margins of suburban areas with suitable shade trees (Figure 4). And, as its name implies, it is widely associated with fruit orchards, the small, widely spaced trees providing ideal habitat (Bent 1958; Kaufman 1996; Scharf and Kren 2010). Basic requirements include a relatively open landscape, the presence of trees that are usually smaller in diameter (7.6–15.2 cm) than those typically preferred by Baltimore Orioles, and a high diversity of trees close to the nest (Clawson 1980). In some regions the species’ range expansion has followed along riparian corridors, such as in West Virginia and Pennsylvania (Scharf and Kren 2010). Indeed, in Minnesota, the species’ range is closely associated with three major river systems: the Mississippi, the Minnesota, and the Red Rivers. Typical breeding habitat of the Orchard Oriole in Minnesota (© Lee A. Pfannmuller). Using data collected by the federal Breeding Bird Survey (BBS), biologists have estimated a global population of 10 million birds, with approximately 9.2 million occurring within North America (Partners in Flight Science Committee 2013; Rosenberg et al. 2016). Because the species is rarely encountered along BBS routes in Minnesota, these data are not robust enough to generate a statewide population estimate. The Orchard Oriole also was too uncommon to generate an estimate using the atlas data. Despite the increase in its statewide distribution, the Orchard Oriole remains an uncommon species in the state, with the majority of its population located west and south of the Laurentian Mixed Forest Province (Figure 1). In Minnesota, for example, an average of less than one bird is detected along BBS routes in the state each year. Further west, in the Great Plains states, observers report an average of 2–3 birds per route, while an average of 8–13 birds are reported per route in the southeastern United States (Sauer et al. 2017). Since the BBS began monitoring birds in 1966, the Orchard Oriole population has experienced a statistically significant annual decline throughout North America of 0.87% per year, for a cumulative loss of 23% (Sauer et al. 2017; Rosenberg et al. 2016). Most of the losses are occurring in the southern reaches of the species breeding range, especially from southern Kansas south to the Texas coast. Population increases, on the otherhand, are concentrated in the northern Great Plains and lower Great Lakes region. The species is encountered so infrequently along Minnesota BBS routes that the resulting population trend, which is increasing, is considered imprecise. Data are sufficient, however, in the Prairie Potholes region, which includes much of western Minnesota. 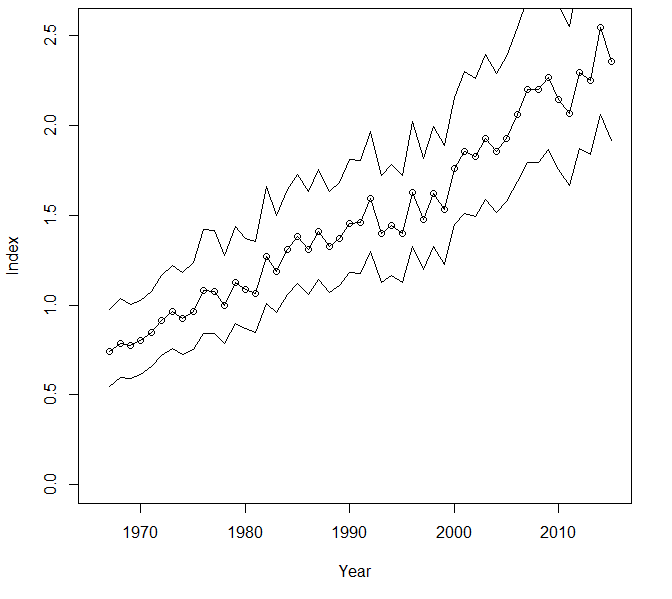 Here, the Orchard Oriole is demonstrating a significant increasing trend, averaging 2.44% per year since 1966 (Figure 5). Although the ebbs and flows of the species’ abundance and distribution have been widely noted, few have postulated factors that may be responsible for these changes. A frequent inhabitant of orchards, the impact of pesticide use must be considered, as well as the loss and degradation of riverine habitats in intensively cultivated agricultural areas. Nest parasitism by Brown-headed Cowbirds, particularly in southern states, is considered a major source of mortality (Scharf and Kren 2010). Less clear, are the factors responsible for local population increases. Certainly its adaptation to more residential environments has created more habitat opportunities for the species. Population trend map for the Orchard Oriole in the Prairie Pothole region from 1966–2015 based on the federal Breeding Bird Survey (Sauer et al. 2017). Despite its overall population decline, Orchard Orioles are widely distributed throughout eastern North America and remain relatively common, particularly in regions to the south of Minnesota. Their moderate Continental Concern Score of 10/20 reflects concern regarding its population decline and threats to its breeding habitat (Rosenberg et al. 2016). The species is not considered a conservation priority at either the federal or state level. Warming temperatures may not pose the same problems to Orchard Orioles as they do to many other temperate breeders. A recent modeling analysis conducted by the National Audubon Society on 588 North American breeding birds found that although the oriole’s current breeding and wintering habitat may contract by the year 2080, many new areas, larger in size than its current range, will provide suitable climate for the species (Langham et al. 2015; National Audubon Society 2015). A great deal of emphasis has been placed on understanding and monitoring grassland species in Minnesota in recent years. Unfortunately, species like the Orchard Oriole, which are more dependent on woodlots within grasslands as well as on riparian habitats, have been overlooked. The species could benefit from a more concerted effort to understand its habitat requirements and management needs in the state. Bent, Arthur Cleveland. 1958. Life Histories of North American Blackbirds, Orioles, Tanagers, and Allies: Order Passeriformes. Smithsonian Institution Bulletin 211. Washington, DC: U.S. National Museum. Clawson, Sharon D. 1980. “Comparative Ecology of the Northern Oriole (Icterus galbula) and the Orchard Oriole (Icterus spurius) in Western Nebraska.” MS thesis, University of Nebraska, Lincoln. Rodewald, Paul G. 2016. “Orchard Oriole.” In The Second Atlas of Breeding Birds in Ohio, edited by Paul G. Rodewald, Matthew B. Shumar, Arron T. Boone, David L. Slager, and Jim McCormac. University Park: Pennsylvania State University Press.